Proper dog health starts with knowing the signs of a healthy dog. When you own a dog, there is a lot to learn. From proper diet and exercise to training, grooming, vaccinations and dental care, keeping your dog in good health is a big responsibility. At times you may think it is impossible to learn everything you need to know. Avoiding common health problems involves choosing the right dog food, watching for ear infections, allergies and digestive problems, using the proper training collar, finding a good veterinarian, and so much more. Like people, proper dog health can be maintained and potential problems can be spotted by simply paying attention. Some illnesses or injuries will first affect your dog?s mood or their daily habits. If your dog is typically upbeat and jolly, a change in their mood can be the first warning that something is wrong. A change in their eating or drinking habits or their sleep pattern can also signal trouble. Regular veterinary check-ups and knowing the signs of a healthy dog are a great place to start. Learning about common dog diseases and symptoms will go a long way toward maintaining your dog’s health. Following is a list of things to watch for when identifying proper dog health. Please consult with your veterinarian if you think something may be wrong. The most common advice about canine health is that a cold and moist nose means your dog is healthy. In many cases this is true, but not always. A dry and a warm nose can indicate a problem such as dehydration, but this isn?t a fail-safe indicator either. Taking your dog?s temperature is generally a good indication of whether you have a sick pooch. You should always be concerned if your dog is having a foul-smelling, thick, yellowish or bubbly nasal discharge. Clear discharge is OK, anything else may require immediate medical attention. Eyes, they say, are the windows to the soul. Your doggy’s eyes are windows to its health and happiness. Shiny and bright eyes indicate good dog health. You should be concerned if the eyelids are inflamed, swollen or have a yellowish discharge. Your dog should not be constantly rubbing its eyes. Moreover, the whites of the eyes should not have a yellowish tinge. All these symptoms tell you that you should take your dog to the vet right away. Dog health is often gauged by the condition of your dog’s skin and coat. 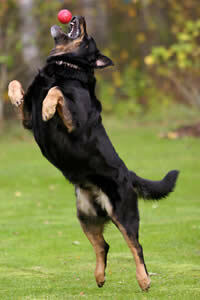 A healthy dog will have a flexible and smooth skin. patches or lesions is not only the sign of a skin problem, but can also be the sign of some other underlying medical condition. Dental health is a very important part of overall dog health. Many people are under the mistaken belief that they do not need to take care of their dog?s teeth. Did you know that certain dental conditions can lead to kidney, liver and heart problems? Firm and pink gums indicate that your dog has good dental health. The teeth should not have any tartar or plaque buildup. Your dog?s gums should not bleed or have any pus discharge. The teeth should definitely not be loose and your dog should not have bad breath. If you see any of these symptoms in your dog, you should consult a vet right away. The normal temperature in dogs is 101 to 102.5 degrees Fahrenheit. If your dog has not been running around and its ear flaps are very hot, it could indicate that your dog has a fever. To find out the exact temperature, you can take your dog?s temperature with a rectal thermometer (yes, it goes in THAT end). When you take your dog for regular walks, you should always keep an eye on its urine and stool. If the urine is clear yellow, it indicates that your dog is in good health. However, if there is blood or your dog has difficulty passing urine, you should take it to the vet. There should not be any blood or mucus in your dog?s stools. If your dog is straining too much, it could mean that your dog is constipated. Talk to your vet about this condition, too. Your dog should not be overweight or underweight. If you cannot feel your dog?s ribs, it means that your dog is overweight. Sudden weight loss or gain is also a worrisome sign and one that requires immediate medical attention. Understanding these basic symptoms will help you take good care of your dog. It would also help if you learn about common dog diseases and symptoms associated with each disease and condition. This will help you catch the disease in time before it does much damage. Remember that certain diseases and conditions cannot be cured beyond a certain stage. To a large extent, promoting and maintaining proper dog health is in your hands. As a responsible and loving dog owner you should do everything possible to ensure your best friend?s good health.